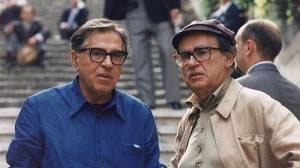 Vittorio Taviani (right) has worked closely with his brother and collaborator Paolo (left) since the 1950s. MIDDLEBURY, Vt. – Award-winning Italian film director and screenwriter Vittorio Taviani will receive an honorary Doctor of Arts degree from Middlebury College on July 25. Michael Geisler, vice president for Language Schools, Schools Abroad and graduate programs, will present Taviani with the degree at a ceremony on campus. His daughter, Giovanna Taviani, was a faculty member at the Italian School during the Middlebury Language Schools’ 2011 summer session. Working closely with his brother Paolo on every project, Vittorio Taviani has been making films since the 1950s. Their established creative method is to write screenplays together and then take turns directing alternate scenes. The Taviani brothers have received several awards for their films, including the Palme d’Or, or top prize, at the Cannes International Film Festival in 1977 for “Padre Padrone.” In 1982 they were awarded the Grand Prix du Jury at Cannes for “'The Night of the Shooting Stars,” which was also voted best film by the National Society of Film Critics in 1983. Born in San Miniato, Italy ― Vittorio in 1929 and Paolo in 1931 ― the Tavianis are the sons of a lawyer who under the Fascist dictatorship encountered the hostilities of the regime for his political ideas. The brothers attended the University of Pisa; Vittorio studied law while Paolo studied literature and humanities. In 1954, they abandoned their university studies and, together with their future collaborator Valentino Orsini, began work on a series of documentaries concerning contemporary social issues largely inspired by Neorealism. Their most recent film, “Caesar Must Die,” won the Golden Bear, or top prize, at the Berlin International Film Festival in 2012.